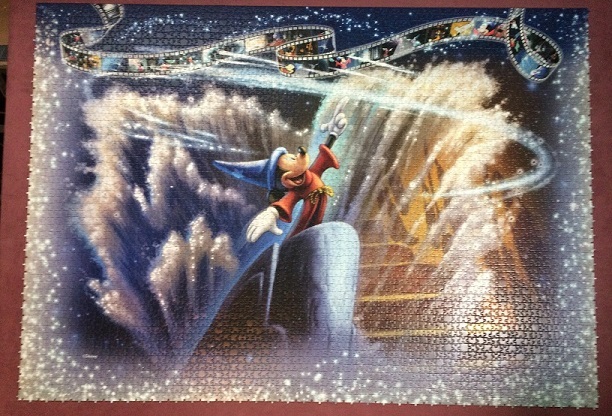 Fantasia was supposed to be the second section assembled, but there was a damaged piece and I had to wait for a replacement bag to be sent to me. As soon as it was available for sale in the United States Ravensburger sent me my new bag of pieces and it arrived just in time as I was finishing The Little Mermaid. Time to get to work! This was the section I felt would be the most challenging, and I had been dreading it since the very beginning. There was no more procrastinating to be done, I had to jump in and get going. If I could assemble The Jungle Book twice in 3 weeks I could certainly deal with Fantasia only once, right? The picture above is after about 4 days of work. It was much nicer for me to have an "edge" in place before I started assembling the middle; I think it made it seem a little more like a regular puzzle. It feels a bit tedious as first dealing with so many twinkly pieces, but I like the end result. I have to say I was a little disappointed in the filmstrip for this section, it only had cells from The Sorcerer's Apprentice - there weren't any from the rest of the film. There were so many wonderful parts to Fantasia it was a bit of a letdown not to have any of them represented. 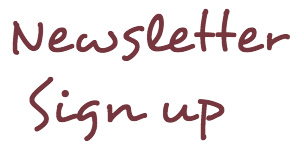 The Dance of the Hours with the animal ballerinas, Night on Bald Mountain followed by the Ave Maria, The Pastoral Symphony with the centaurs, etc. There was so much great animation in this movie that I would have loved to have seen represented. Mickey looks great close up, I wanted to show the detail. I was pleasantly surprised that I pulled almost all of him on the first sort. With all the white in this image I was shocked that I was only missing 3 pieces of his gloves. Most of the brown staircase is complete, and in one week I was past the halfway point! It was definitely challenging, but not quite as much as I thought it would be. 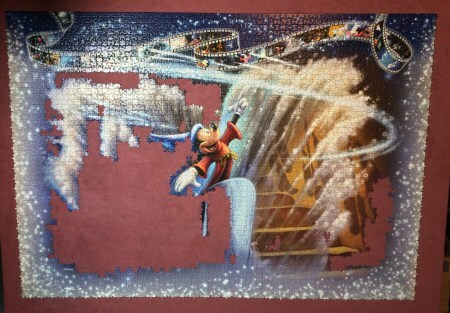 The sprays of water and the foam were actually helpful in placing pieces. I thought they'd pretty much all look the same, but once again I was wrong. It's going together quite well at this point and I'm still having a great time with it. Things are filling in nicely, and at this point I'm working towards completing the right side so that the left side will be easier to fill in. Unfortunately, this is where my overhead light went kaput, and working in the evening was a no-go until I was able to get it replaced. Luckily I have an awesome husband who made the time to get it switched out for me as soon as he could. 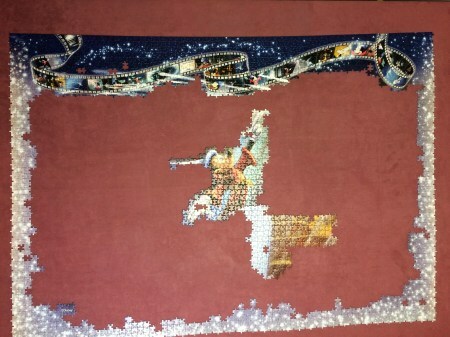 And here we are, 70% of this giant puzzle is complete! 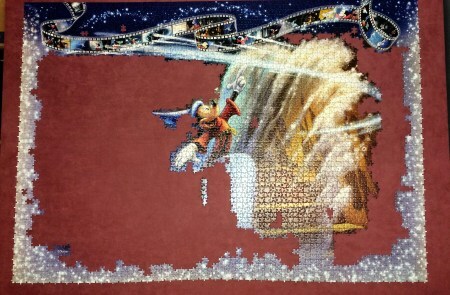 It's a beautiful section, and I got it finished in only 15 days. Not bad. I didn't need to dread this one, because although it was definitely one of the more difficult sections I didn't find it as hard as Peter Pan. In Fantasia most of the pieces had something to help with placement - foam, bubbles, magic swirls, etc. 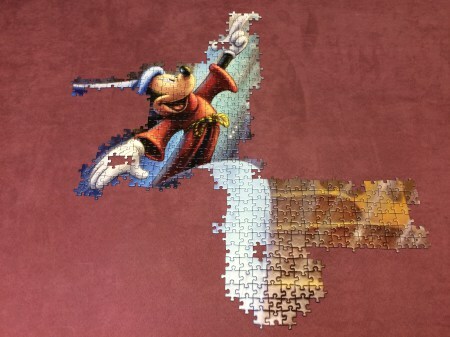 In Peter Pan much more of the pieces were flat color, with not much else to help find their place. I was so glad to get this section under my belt, and working on this one made me excited to get going on the last 3 sections. They all have several characters and bright colors - I was looking forward to all of them! Up next - The Lion King.